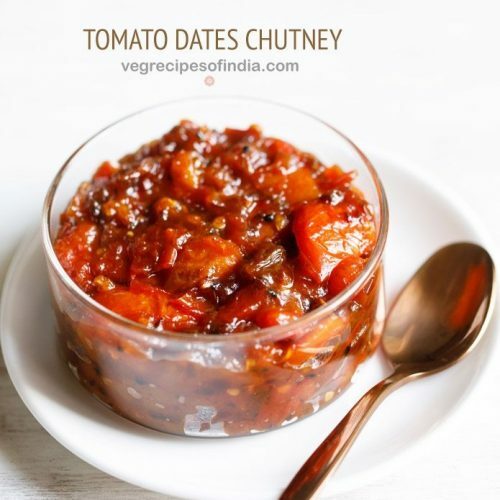 bengali style tomato and date chutney recipe - a delicious, sweet and spiced tomato chutney made with dates and with the flavors, aroma of panch phoron (bengali 5 spice mix). 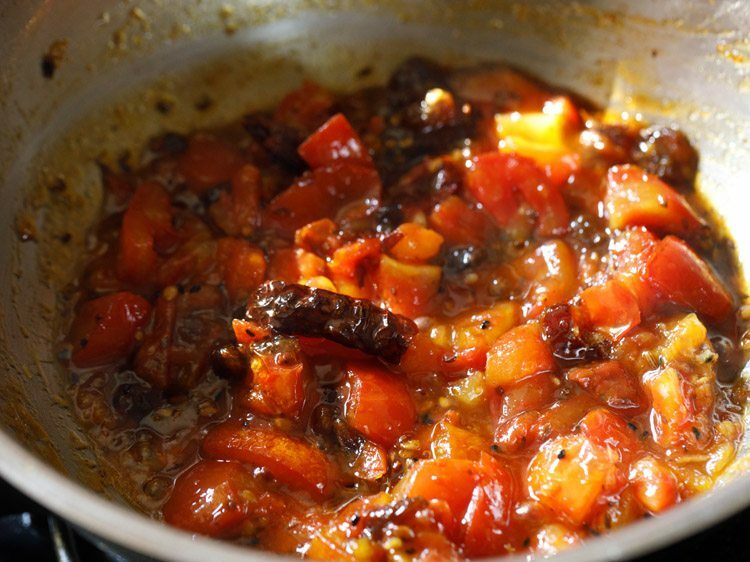 bengali tomato khejur chutney recipe with step by step photos. this is a delicious, sweet and spiced tomato chutney made with dates having the flavors & aroma of panch phoron (bengali 5 spice mix). i wanted to try this tomato chutney from a long time and had made it during one of the days during durga pooja festival. 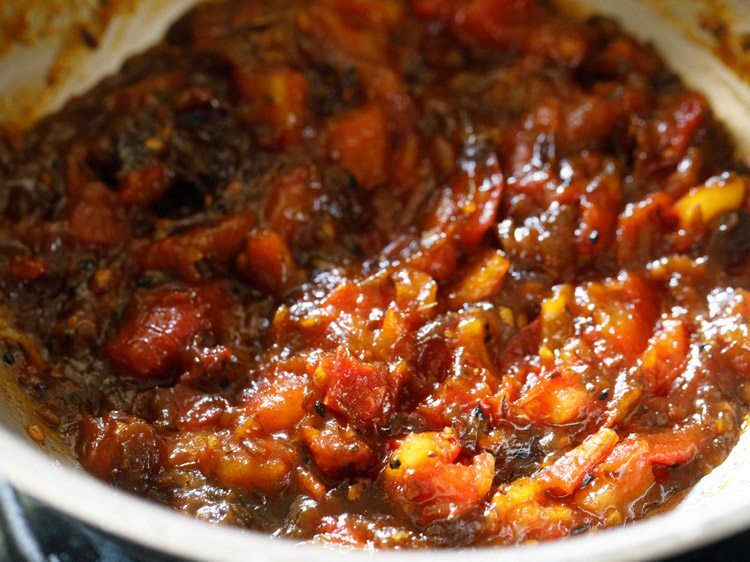 this tomato and date chutney is an absolute winner both in preparation and taste. i have had bengali tomato khejur chutney before in a thali meal served during a bengali pooja feast, so it was easy for me to know its taste and flavor. 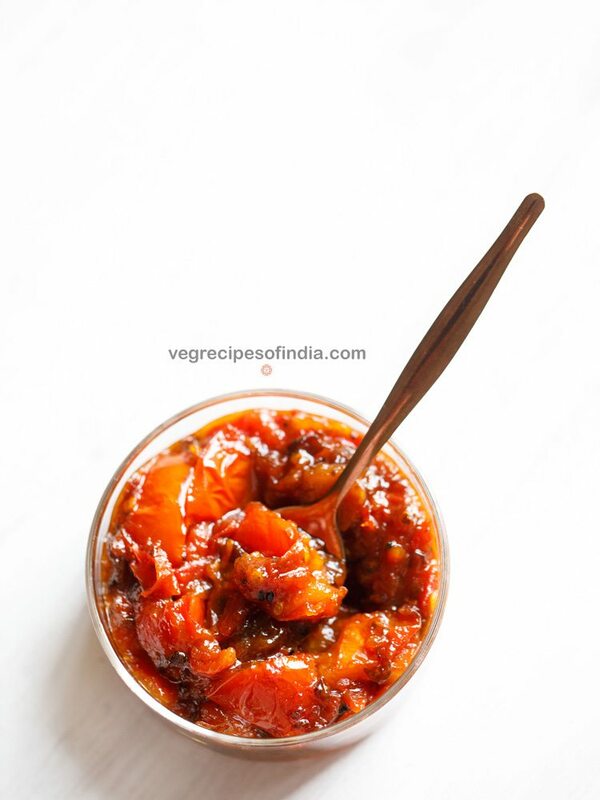 usually this sweet tomato chutney is served after the meal is over with some fried papads, but we had it as a side dish with a sabzi and chapatis. 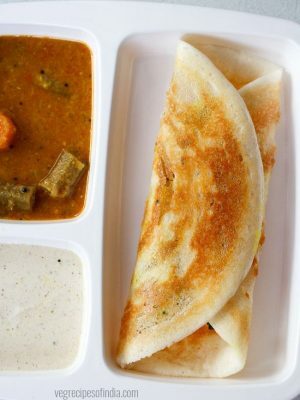 you can serve tomato chutney as a side dish. leftovers can be refrigerated for 4 to 5 days. 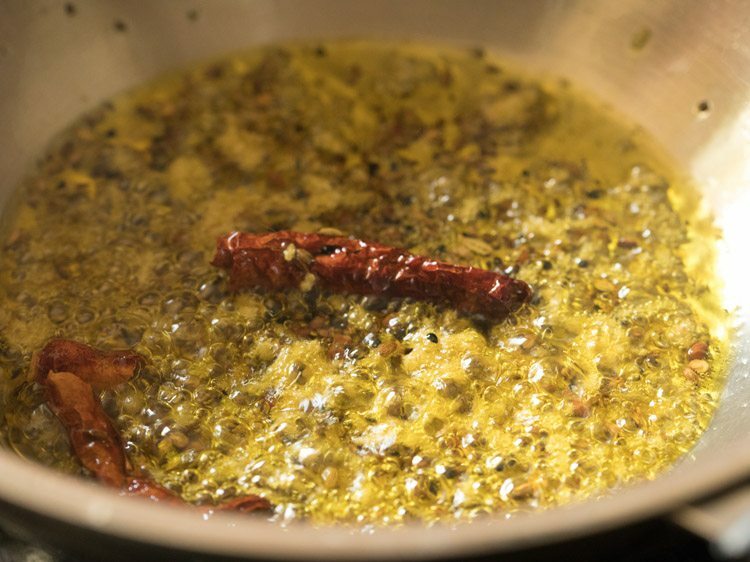 heat 2 tablespoons mustard oil in a heavy kadai or pan. keep the flame to a low and let the mustard oil begin to smoke. 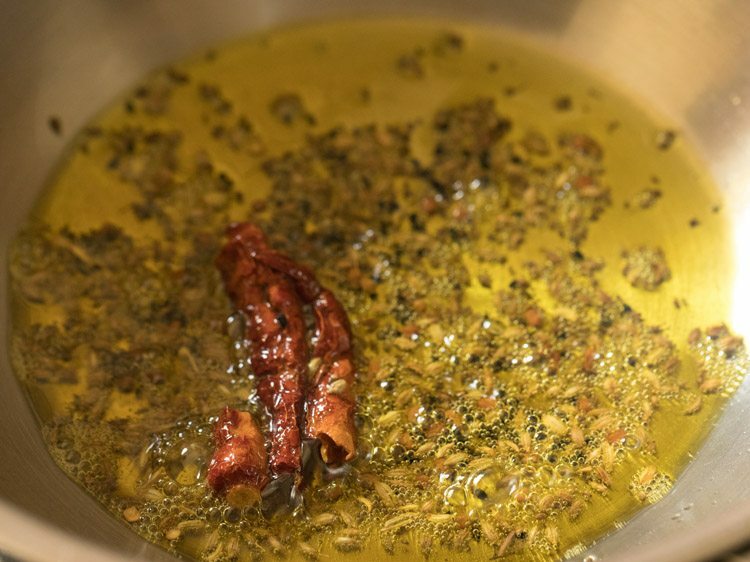 then add 1 teaspoon panch phoron. 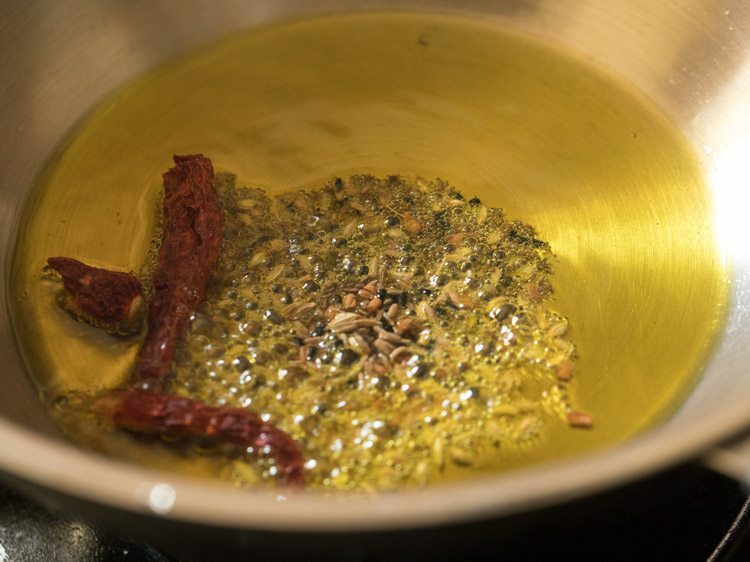 if you do not have panch phoran then add a mix of ¼ teaspoon fennel seeds, ¼ teaspoon of nigella seeds, ¼ teaspoon of cumin seeds, ¼ teaspoon mustard seeds or radhuni seeds and ⅛ or ¼ teaspoon of fenugreek seeds. immediately add 2 dry red chilies (seeds removed). fry for some seconds till the spices crackle and become aromatic. then add 1 teaspoon grated ginger. saute for some seconds till the raw aroma of ginger goes away. don't brown the ginger. add 1.75 cups chopped tomatoes. mix tomatoes with the rest of the spices and oil. 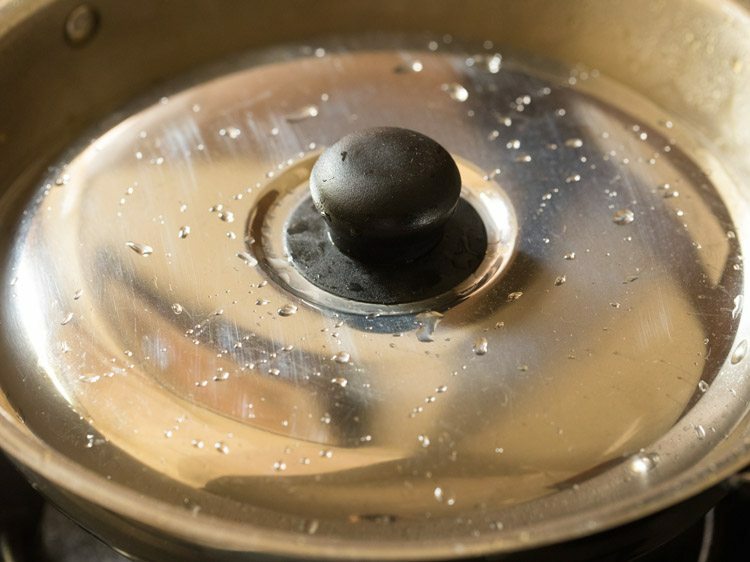 cover the kadai or pan with a lid. let the tomatoes cook till they soften. 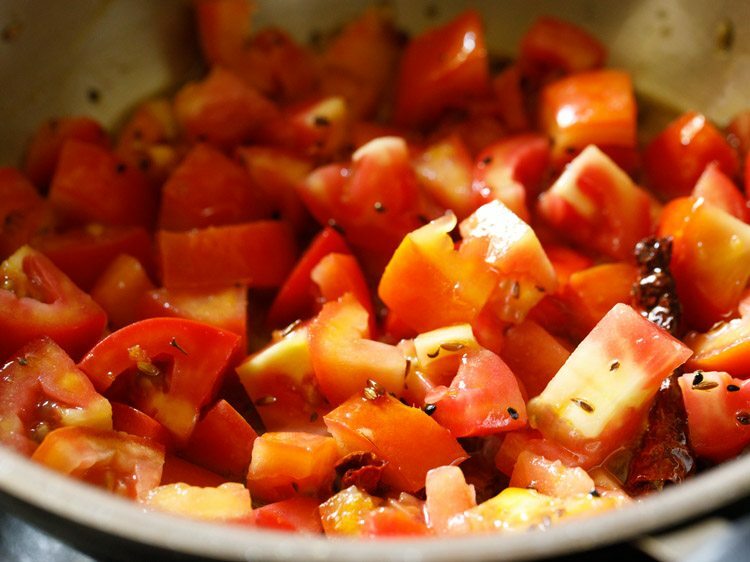 cooking tomatoes takes about 9 to 10 minutes on a low to medium-low flame. in between do check a couple of times when the tomatoes are cooking. let the tomatoes soften and becomes mushy. now add 1 tablespoon raisins and 2 tablespoon chopped dates or 4 dates, chopped. add 1 to 2 tablespoons sugar and 1 teaspoon dry mango powder (optional). 2 tablespoons sugar gives a more sweet taste. for less sweetness add 1 tablespoon sugar or you can skip sugar completely. mix again. the sugar will melt and you will see a liquid consistency in the tomato chutney. 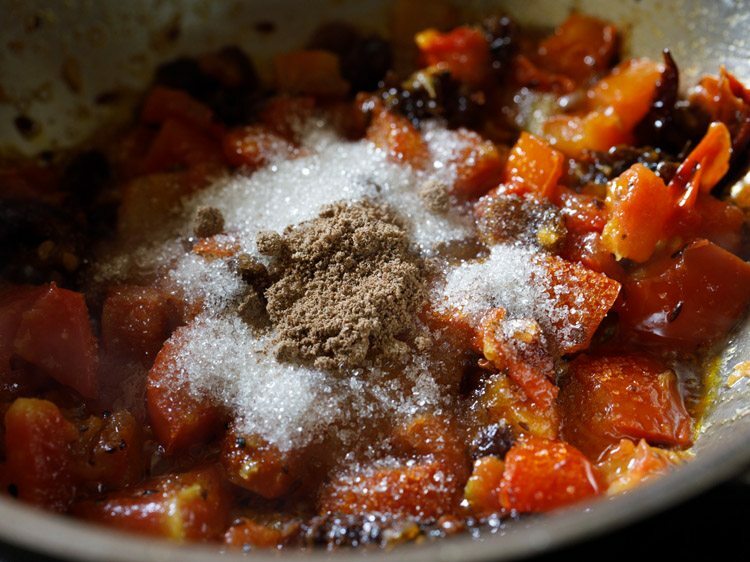 after adding sugar, stir often and mash tomatoes with spoon or spatula. cook till the tomato chutney thickens for about 4 to 5 minutes. 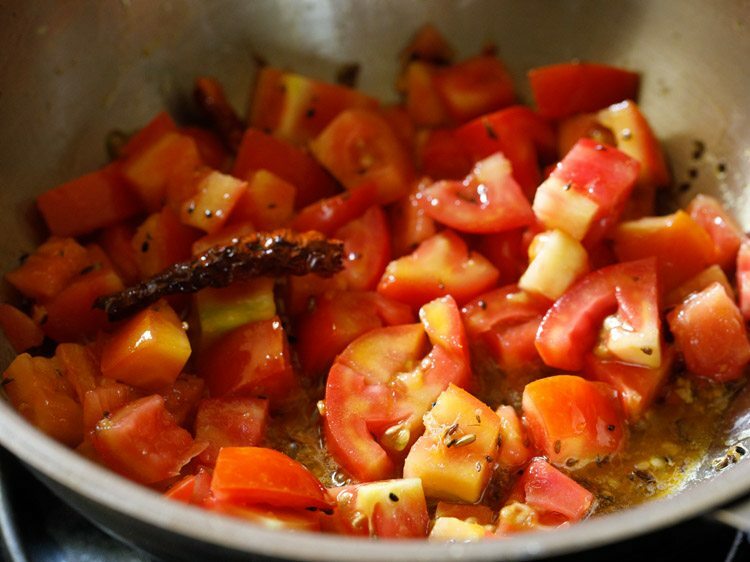 if the tomatoes start sticking to the pan, then add some water and cook. i did not add any water. once done switch off the flame. 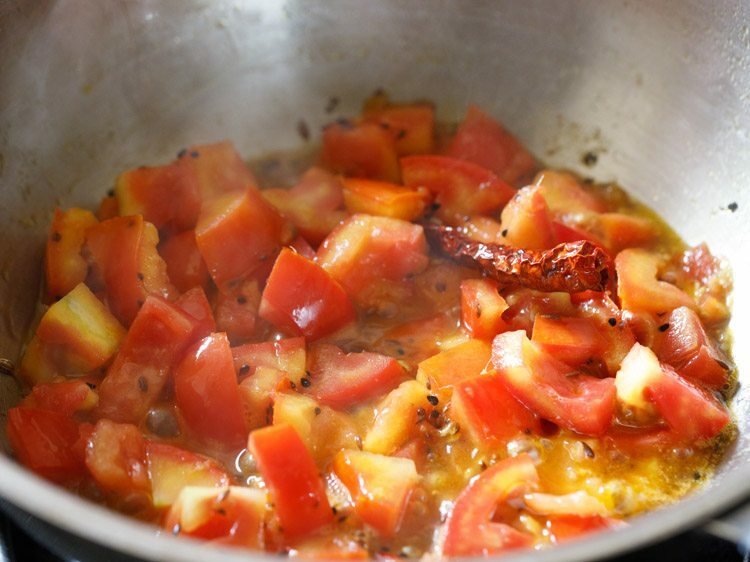 serve tomato khejur chutney warm or at room temperature with a bengali meal. leftovers can be kept in a small airtight bottle or bowl and refrigerated. stays well for 4 to 5 days in the fridge. 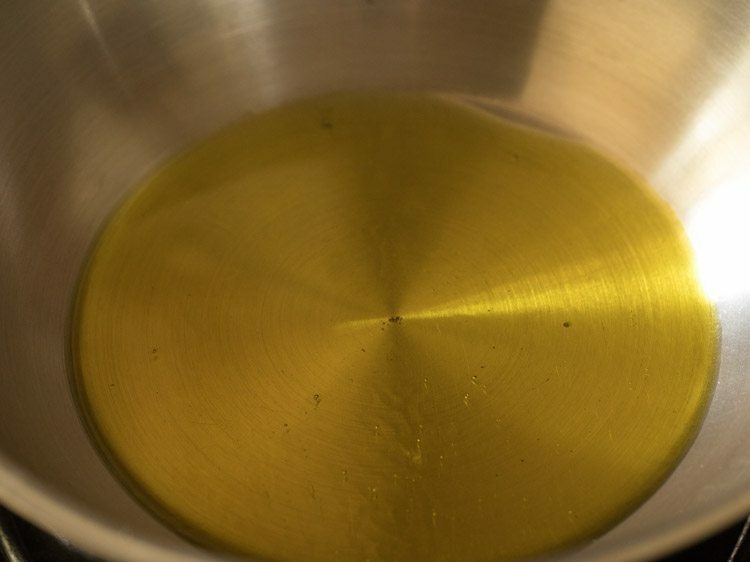 1. heat 2 tablespoons mustard oil in a heavy kadai or pan. keep the flame to a low and let the mustard oil begin to smoke. 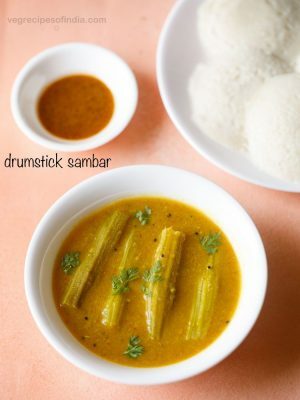 2. once the mustard oil begin to smoke, then add 1 teaspoon panch phoran. 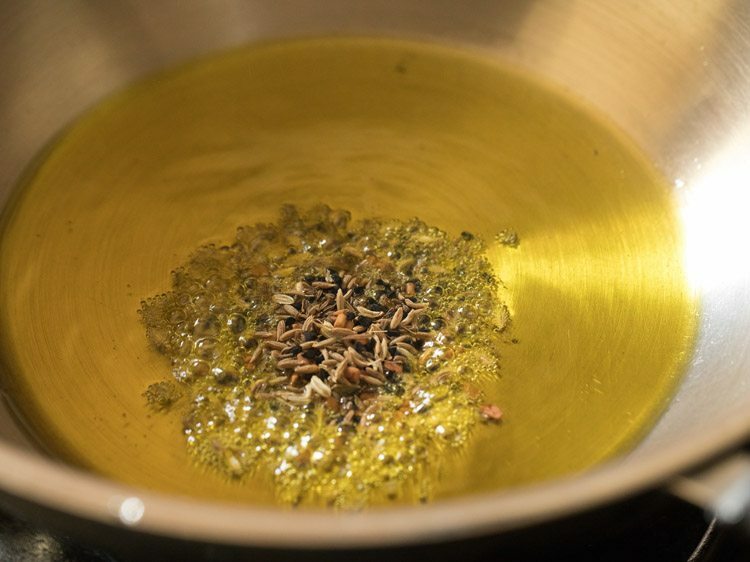 if you do not have panch phoran then add a mix of ¼ teaspoon fennel seeds, ¼ teaspoon of nigella seeds, ¼ teaspoon of cumin seeds, ¼ teaspoon mustard seeds or radhuni seeds (wild celery seeds) and ⅛ or ¼ teaspoon of fenugreek seeds (methi seeds). 3. immediately add 2 dry red chilies (seeds removed). 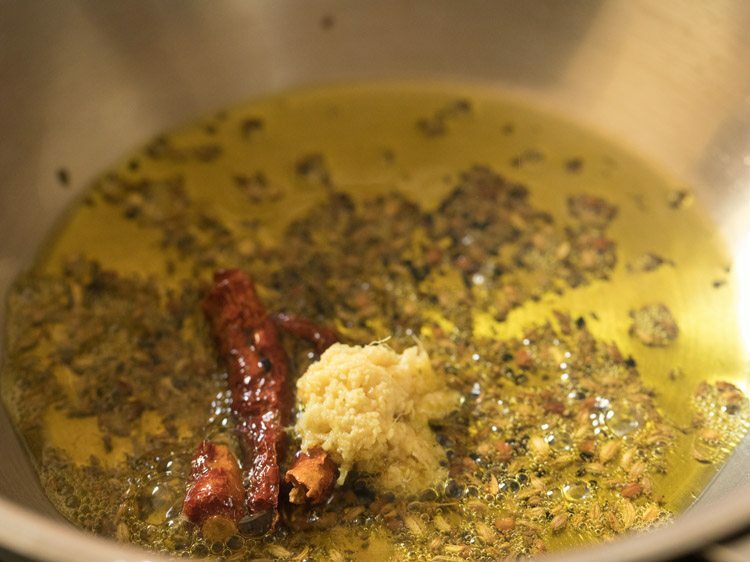 4. fry for a few seconds till the spices crackle and become aromatic. 5. then add 1 teaspoon grated ginger. 6. saute till the raw aroma of ginger goes away. don’t brown the ginger. 7. add 1.75 cups chopped tomatoes. 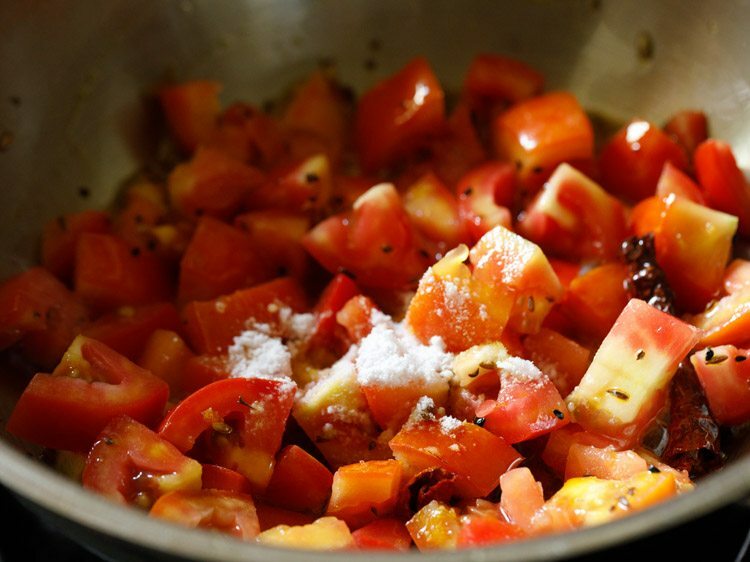 8. mix tomatoes with the rest of the spices and oil. 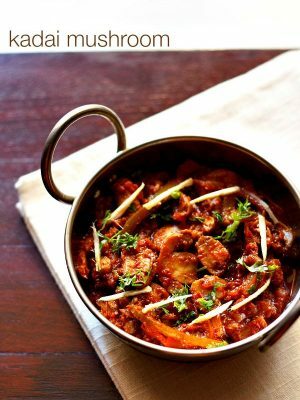 11. cover the kadai or pan with a lid. let the tomatoes cook till they soften. 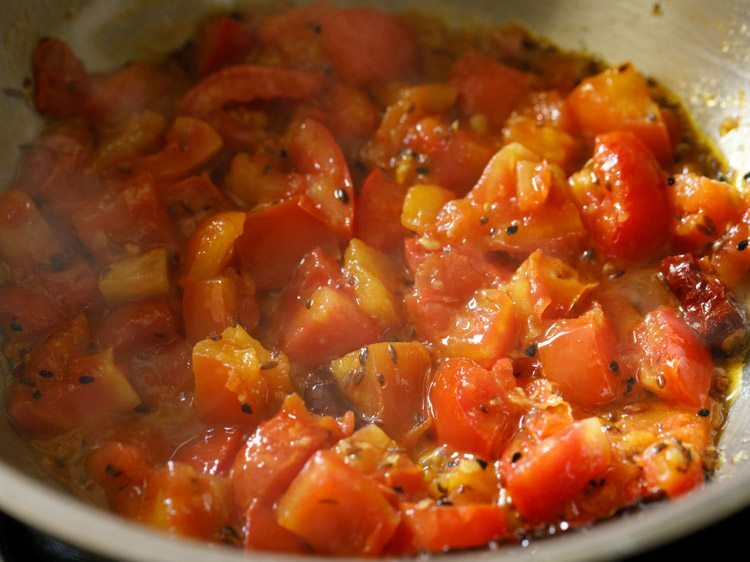 cooking tomatoes takes about 9 to 10 minutes on a low to medium-low flame. 12. in between do check a couple of times when the tomatoes are cooking. 13. let the tomatoes soften and becomes mushy. 14. now add 1 tablespoon raisins and 2 tablespoon chopped dates or 4 dates, chopped. remove the seeds from the dates before chopping them. 16. add 1 to 2 tablespoons sugar and 1 teaspoon dry mango powder (optional). 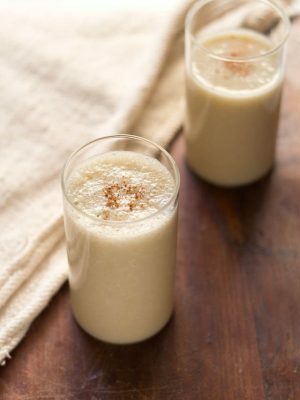 2 tablespoons sugar gives a more sweet taste. for less sweetness add 1 tablespoon sugar or you can skip sugar completely. addition of sugar depends on the tartness of the tomatoes, so add as required. dry mango powder can be skipped. you can even add a bit of tamarind pulp if you want. 17. mix again. 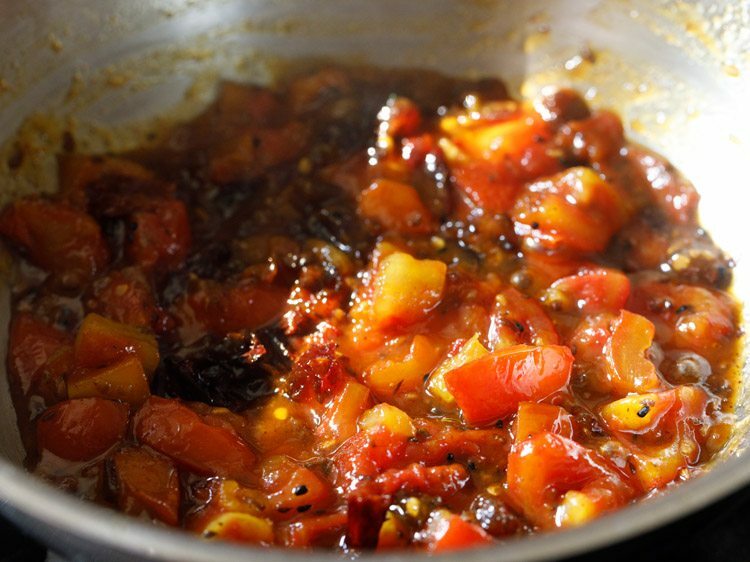 the sugar will melt and you will see a liquid consistency in the tomato chutney. 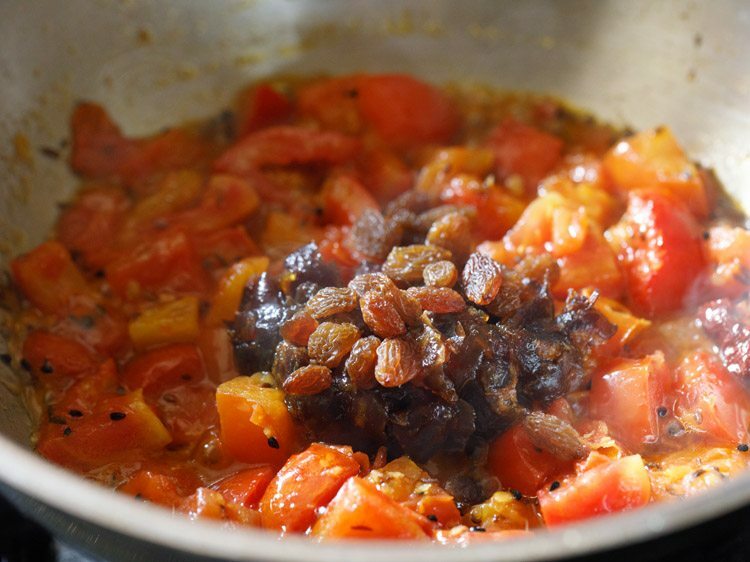 18. after adding sugar, stir often and mash tomatoes with spoon or spatula on a low flame. 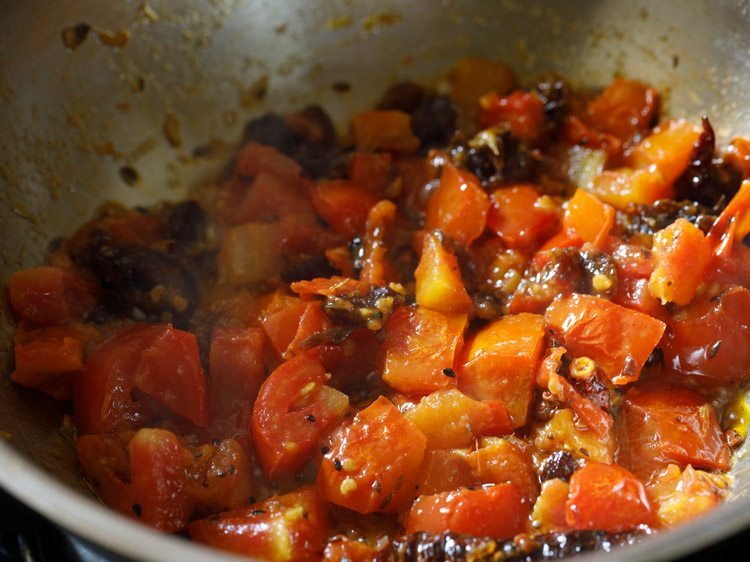 19. cook till the tomato date chutney thickens for about 4 to 5 minutes on a low flame. 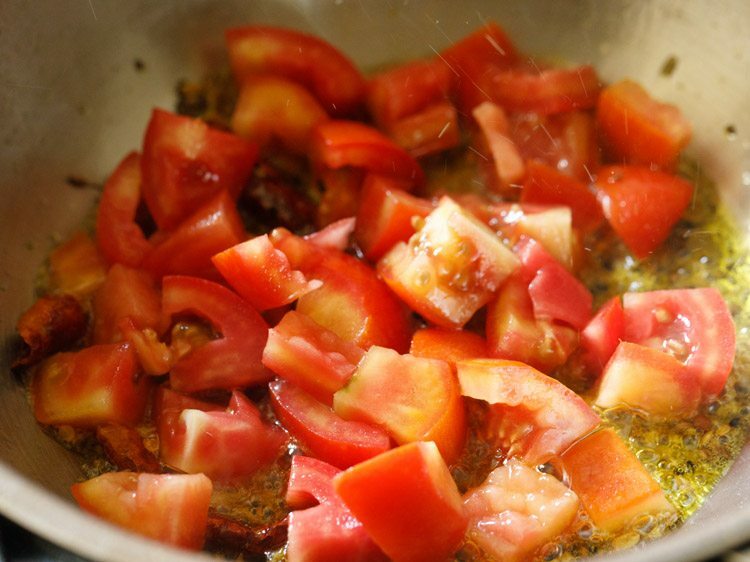 if the tomatoes start sticking to the pan, then add some water and cook. i did not add any water. once done switch off the flame. 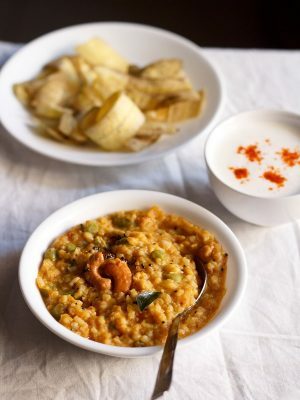 19. serve tomato khejur chutney warm or at room temperature with a bengali meal. leftovers can be kept in a small airtight bottle or bowl and refrigerated. stays well for 4 to 5 days in the fridge. for more delicious tomato recipes you can check this collection of 26 tomato recipes. 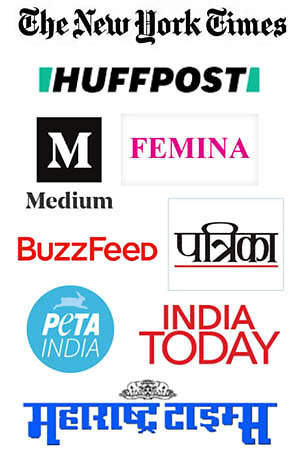 All your recipes those I have tried are amazing…my family members love them all…. 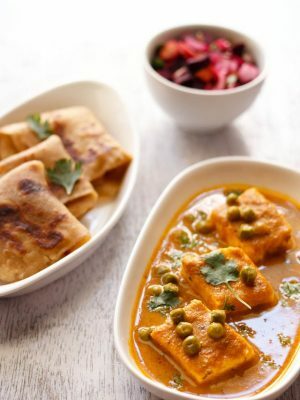 I am a maharashtrian married to a bengali…with your recipes i gets easy for me to impress my in laws..
thanks sharvari. i am glad that the recipes are helping you. thanks again. 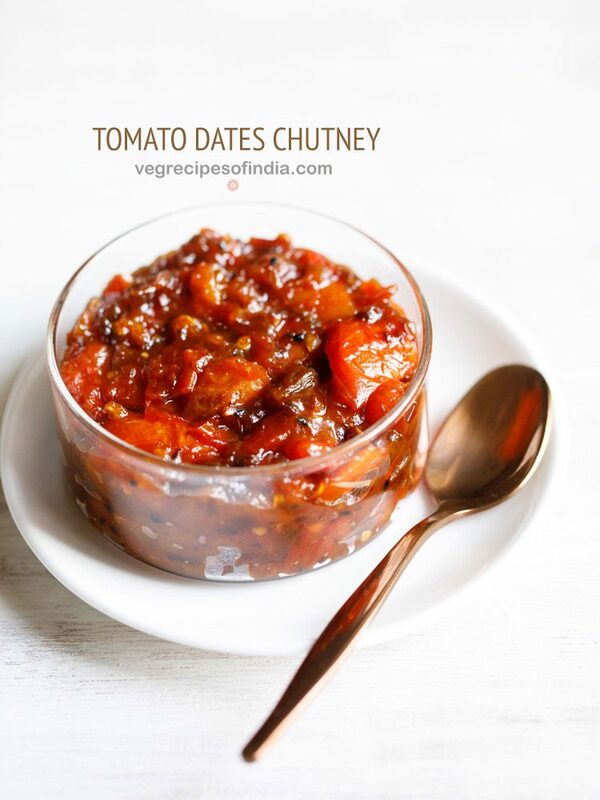 A lovely tangy and sweet chutney . A lovely combination of sweetness of dates and raisins and sourness of tomatoes and amchur. A lovely addition to lift any ordinary meal . Dassana would you know by any chance how to make satori or sometimes called Sanjori. 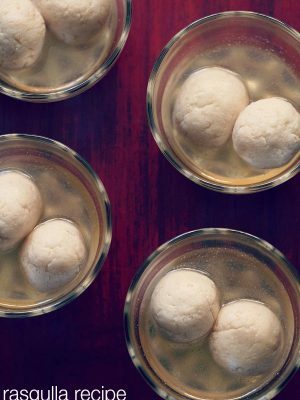 It is a maharastrian sweet basically like a puri made of maida and rava filled with khoya ,sugar or jaggery. thanks anu for the feedback on tomato chutney. i know about sanjori. 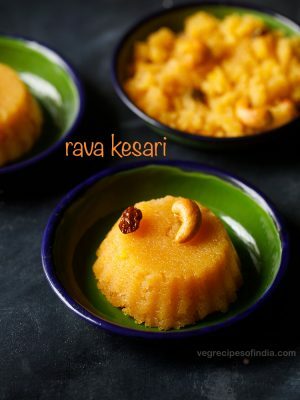 i will try to add the recipe, but cannot say if i can make it before diwali.